The Great Egret is the largest of the white herons to occur in Tennessee. Its name has changed several times in the past 100 years and is playfully called the Great Common American Egret by birdwatchers. This species is wide-ranging occurring in North and South America, Europe, Africa, Asia, Australia, and New Zealand. The Great Egret can be found along lakes, ponds, and rivers, primarily in West Tennessee, from March through October with a few individuals occasionally spending the winter in the state. 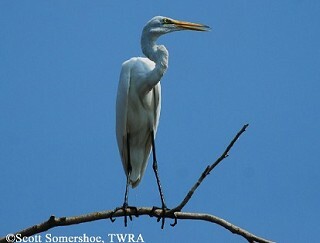 Description: This large, long-necked, long-legged wading bird is pure white with a yellow bill and dark legs and feet. In breeding plumage adults have longish plumes descending from their tails. They typically fly with their neck pulled back in a S-curve. Males and females look the same. Snowy Egrets are smaller, have a black bill that is yellow only near the eye, and dark legs with yellow feet. The immature Little Blue Heron (last Little Blue Heron image at link) is also white, but is smaller, has pale greenish legs, and a pale bill with a black tip. Cattle Egrets can have a yellow bill and black legs during the non-breeding season, but are much shorter and stockier. During the breeding season they have a orange wash over the head, back, and chest. Cattle Egrets are often found foraging in grassy fields and farm fields rather than near water. Habitat: Lakeshores, large marshes, rivers, ponds, and rarely grassy fields near water. Diet: Fish, invertebrates, amphibians, reptiles, birds, and small mammals. When foraging they walk slowly, stands and stabs prey with quick lunge of the bill. Nesting and reproduction: Great Egrets nest in colonies with other herons and egrets, mainly in West Tennessee, but small numbers are found in colonies in Middle and East Tennessee. They begin arriving at nesting colonies in March. Clutch Size: In Tennessee, clutches of 2 to 5 eggs have been found, with 4 eggs most common. Incubation: Both adults incubate for 23 to 26 days. Fledging: The male and female regurgitate food for the young, which are able to climb into tree limbs at 2 to 3 weeks old, and can fly to follow their parents to feed at 6 weeks of age. Nest: Begun by the male during courtship, the nest is a stick platform placed in trees or shrubs in seasonally or permanently flooded forested wetlands. Nests from previous years are often rebuilt. Nest heights range from 8 to 40 feet. 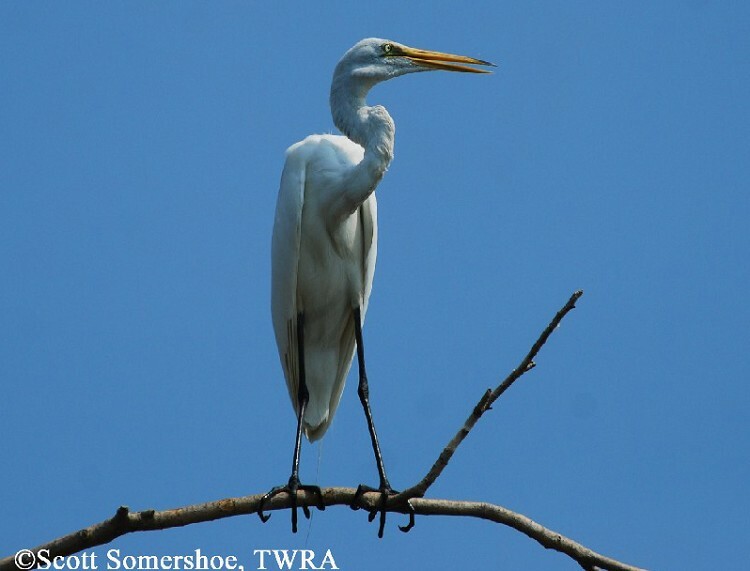 Status in Tennessee: The Great Egret is an uncommon breeding bird and a rare winter visitor to the state. It nests in scattered colonies with other herons and egrets primarily in West Tennessee, but has been recorded nesting elsewhere in the state. The Great Egret is most numerous in Tennessee in late summer when post-breeding migrants from outside the state are present. In 1976 the Great Egret was listed as In-Need-of-Management because of declining numbers and threats to wetlands. Current Breeding Bird Survey results indicate the population may be increasing in the state. Plume hunters in the late 1800s and early 1900s reduced North American populations by more than 95 percent. After the passage of the Migratory Bird Treaty Act in 1918 populations began to recover. The Great Egret is the symbol of the National Audubon Society, one of the oldest environmental organizations in North America. The National Audubon Society was founded to protect birds from being killed for their feathers. Aggression among nestlings is common and large chicks frequently kill their smaller siblings. The longevity record for a wild Great Egret is nearly 23 years. Best places to see in Tennessee: Great Egrets can be found statewide around lakes, rivers, farm ponds, streams, and occasionally in pastures, especially in West Tennessee. Most easily found during August and September . McCrimmon, D. A., Jr., J. C. Ogden, and G. T. Bancroft. 2001. Great Egret (Ardea alba). In The Birds of North America, No. 570 (A. Poole and F. Gill, eds.). The Birds of North America, Inc., Philadelphia, PA.